The elite are venturing towards looking for exclusive spaces involving a seamless integration of international design concepts, creating spaces that are a perfect fit for a lifestyle which includes concierge facilities, lounges, private meeting & dining rooms among other quintessential services. As Bangalore’s first private luxury, members-only club, BLVD Club is all about creating the ideal setting for an indulgent lifestyle for its members. With subtlety and elegance in strong focus, the club offers 100,000 sq. ft. of state-of-the-art sports, recreational, business and dining facilities. At Boulevard, one can enjoy preferential access to a world of privileges and enjoy a community of likeminded individuals. 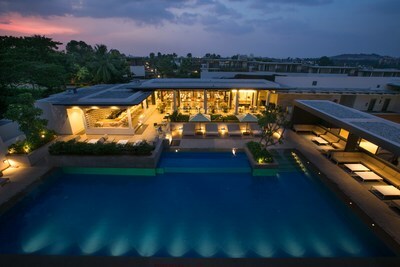 A leisurely 20-minute drive from the Bangalore International Airport Road, BLVD Club, India’s first private luxury club located inside the sprawling Embassy Boulevard campus, combines exclusivity and sophisticated luxury that indeed belongs to the chosen few. The location presents a compelling paradox: the serenity is a throwback to old Bengaluru and yet it is the address of the future. To cater to the specific requirements of members, BLVD offers bespoke Individual and Corporate Memberships, which provide members and their families with immediate access to all the club’s facilities. The perks of membership also include various benefits at Embassy Group’s partner hospitality brands in the city, in the form of discounts that can be availed at Hilton Bangalore Embassy Golf Links, Le Meridien Hotel, restaurants like Sanchez, Sriracha and Eden Café, the premium food delivery app – Entrée, along with special discounts at the Embassy International Riding School and WeWork. The Club also has a curated cultural programming calendar for the members every month which is highly sought after. To offer BLVD members similar experiences across the globe, BLVD Club is also affiliated to some of the premier clubs of the world that are on par with its eminence, both in terms of its status and its offerings. Embassy is one of the leading property developers in India with a track record of over three decades in real estate development. Embassy has an extensive land bank across the country and has developed over 53 million sq ft of prime commercial, residential and retail space in India. Embassy’s portfolio of real estate developments spans the commercial, residential, industrial & warehousing, retail and hospitality segments of the real estate industry. Embassy’s ongoing residential projects include luxury apartments, villas and integrated townships. The Residential portfolio includes 12 million sq feet completed, and 17 million sq. feet of ongoing and future development. Embassy’s Hospitality business comprises of 2 Hotels in Bangalore, and 5 under construction, including the Four Seasons Hotel scheduled to open in Q1 2019. A pioneer in leasing office space and developing integrated office parks, Embassy Group has delivered over 40 Million Sq. Ft. of commercial properties across 6 cities in India, providing office space to more than 250 blue chip corporate occupiers. In 2012, Embassy Group and Blackstone entered into a joint venture to form Embassy Office Parks – an entity aimed at creating world class office spaces and building business communities. Some of the marquee commercial assets developed by Embassy Group include Embassy GolfLinks, Embassy Manyata Business Park, Embassy TechVillage and Embassy TechZone housing several multinational and Fortune 500 companies.